This is about the 7th nap failure in the past 3 days, so I’m sitting here typing on my phone while rocking the baby, who’s “nursing” in her sleep, the only way , evidently, that she will sleep these days. But today is Sunday, and Tom is grading papers in his workshop while Lucy builds nests on the driveway (piles of leaves, branches, berries, acorns, etc) and Lena naps. On a weekday, I would have to take the crying baby, who’s woken up the second I lay her in her crib, and make sure that the toddlers aren’t getting into any mischief. I’m fairly desperate to have this baby sleep, hoping to catch her up on a really bad sleep deficit, so I’m taking advantage of the second parent being around and letting her nap in my arms. (Yeah, sleep regressions are terrible but I’ve come to expect them with each child and try to take the long view that she’ll soon be a normal, sleeping, older baby. And frankly when compared to the rest of the horrifying political/social/etc. events going on in the outside world, I’ll take it). At any rate, Maeve is growing like a weed, crawling on actual hands-and-knees, and pulling up to stand, often one-handed, any chance she can. SLOW DOWN, baby, slowwww down. She has two bottom teeth and there are two more about to pop on either side [and the baby sleep experts try to tell me that teething doesn’t affect sleep….rolling eyes emoji forever]. She’s pretty fat, wearing 9-month and a lot of 12-month clothes, waves, and of course says “Da-Da” all the livelong day. But, to be clear, only Mama will do, all the livelong day (and night). 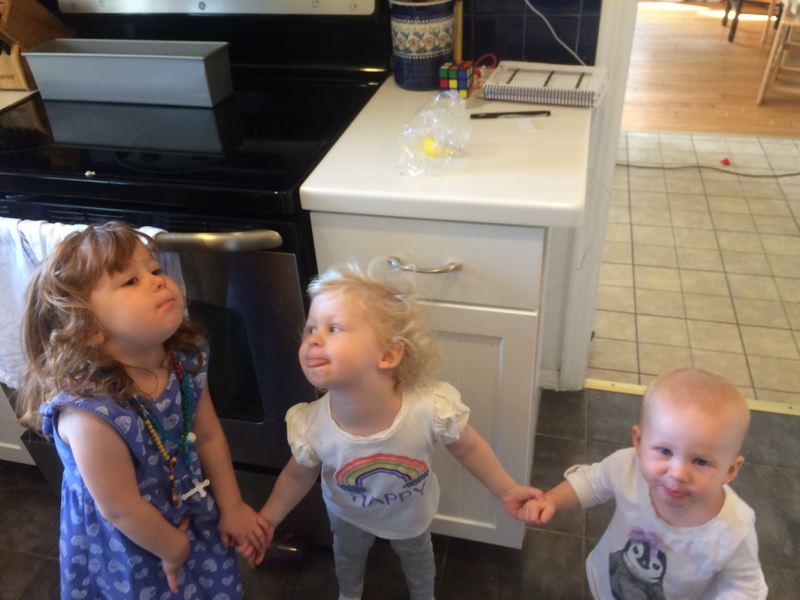 His parents came out to visit for a fun-filled and week at the beginning of the month; it was their first visit since Lucy was 2 months, and the first time the older two had seen them since Christmas 2014. 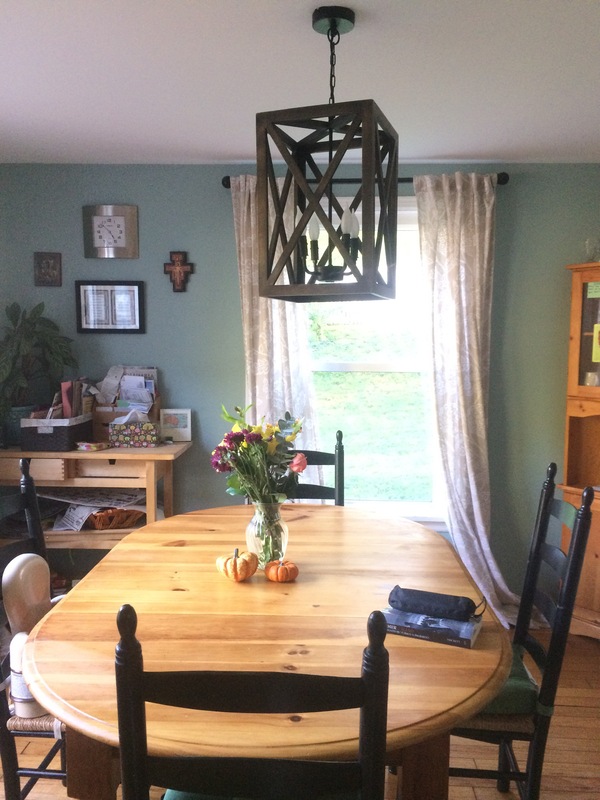 Tom and his Dad did a TON of house/fixer-upper projects, not least of which is that really, really lovely light fixture in our dining room. Love it so much. Also got a new, functioning, front doorknob and a handrail going up the stairs! I failed epically at getting good pictures with the grandparents! But they loved walking to the park with Grandma and Grandpa! And in the midst of the busy-ness and to-dos, we’ve been trying move onward and upwards from survival mode to thriving, to maximize our efficiency, winnow out time-sinks and bad habits and anything that isn’t enriching our lives, really. We’ve reorganized all the closets in the house, made the nursery into an actual nursery for Maeve, gotten rid of a lot of toys and baby clothes, and even my entire dresser (I can fit my wardrobe in the closet either hanging from hangers or in two sets of these shelves bolted into my closet, with a bit of overflow in my nightstand drawers). 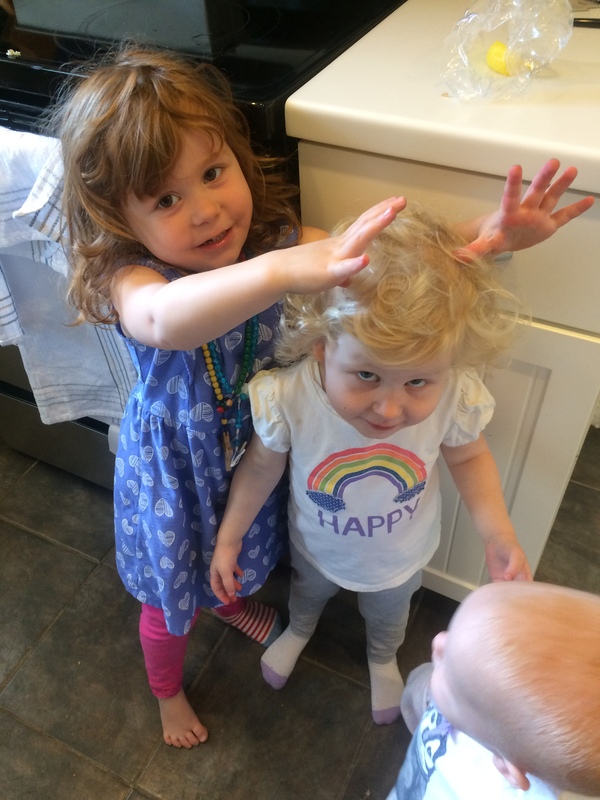 I’ve been trying to figure out better rhythms for our days at home, what kinds of activities will both keep Lucy busy and yet not destroy our house if I need to leave her alone to try to get Maeve to sleep for the billionth time. 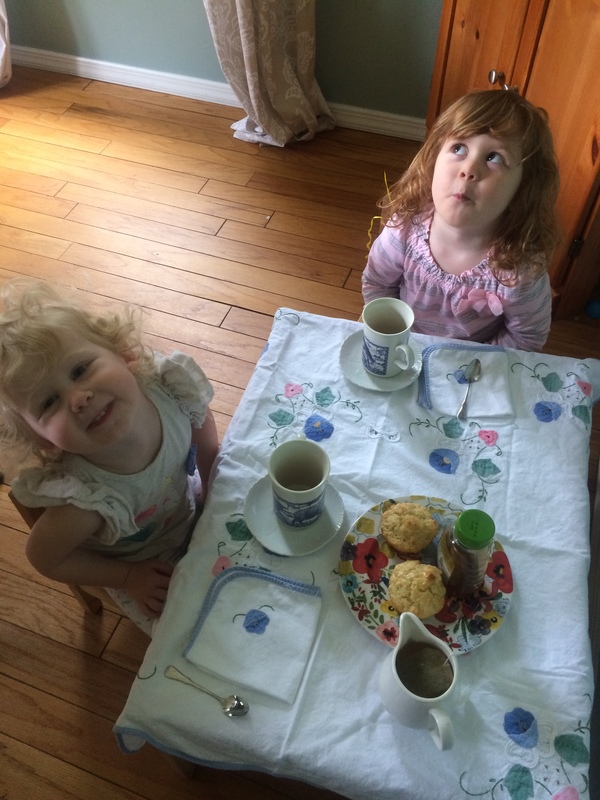 What I’ve been realizing increasingly over the past few weeks is that this task of mothering and running the household takes immense self-discipline on my part (yes, sheer genius, I know!). I’m the arbiter of the daily schedule, my mood sets the tone for our day, for better or for worse. If I give in to laziness or dawdling or multiple distractions, the kids act out. The baby’s nap gets ruined (ok, she also ruins it all on her own lots of the time too). The house still has massive piles of clutter and dirty floors. Every day is a struggle to determine the right balance between making our house a clean, happy place, and not stressing if the kids’ needs literally leave no time for me to shower, let alone clean the bathroom. Between industry and rest, between working on habit formation and just enjoying the littleness of the children. There are little things I can do to make very quotidian tasks easier and even somewhat enjoyable: pre-sort the laundry (and teach the toddlers to separate their darks and lights), insist on all the toys or previous activity to be completely put away before moving on, bake with the older girls just for fun. And then little things that make me happy and also make more sense economically and health-wise; I’ve finally started making our yogurt, since we plow through it each week, and it’s beyond easy and foolproof. I spent a good deal of time researching ways to improve my sourdough bread baking so that I could make our bread again, without getting frustrated. Yes, they take a little more forethought in my already busy life, but they’re things I’ve decided are worth it, and worth prioritizing over others, (such as dusting more often) because for me, the process is rejuvenating and enjoyable AND the results are delicious and give something tangible for my family to enjoy. We are all looking forward to enjoying as much of this amazing fall weather as we can, spending tons of time outdoors without getting eaten alive or sweating to death. It’s a glorious season, and it’s really amazing to have these sweet, innocent children who just enjoy things so freely, with no concept of how utterly crazy things are in the world right now. They’re the perfect antidote, really, and they teach me a lot about living in the present moment. Sleeplessness and all, we’re a lucky bunch! Despite the fact that I haven’t written about books since before Maeve was born, I have been reading since then! There was that lovely period of time right after she was born when I stayed in bed for awhile and Tom was home, so I got to read a lot while nursing/holding a sleepy newborn. 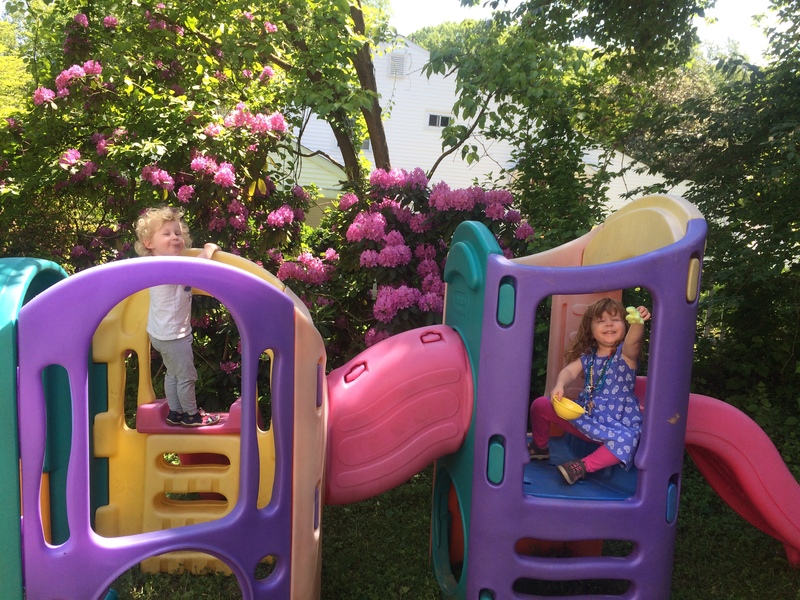 Then followed some stretches of fussy baby waking up to the world, and far less reading, and then a bit of a crazy spring /summer, during which I was supposed to read Brothers K for book club (still working on it- halfway there!). But I’m confident that I’ll finally be able to get a lot more reading in, primarily because we moved Maeve’s crib into the nursery. So no more tiptoeing in the dark to get ready for bed, and worrying that every whisper and creak will wake her up, much less turning on a light. Anyway, of the books I read, there were some hidden gems, some that were just ok, and a couple I won’t be rereading! Where has this hidden gem been all my L.M.M.-obssessed girlhood??! This is a such a different story! Her heroine starts off as just the most awful, pitiful, mousy character, and her transformation is glorious. L.M. Montgomery shines, as she always does, in painting vivid characters, hysterical caricatures, fun plot twists, and glowing descriptions of a place that sounds heavenly. I started this shortly before having Maeve and finished it the night we brought her home. I highly recommend it, especially if you were a fangirl of Anne, Emily, Jane, Pat, and any other L.M. Montgomery series. Since the main character is just a bit older (late 20s) than most of Montgomery’s female protagonists, it especially makes great reading for a grown-up Anne fan. Willa Cather strikes again! This book is long-ish, but I had a lot of nursing sessions in late February through March! 😉 I particularly found it interesting because the main character is a plucky young girl from middle-of-nowhere Colorado who has an extraordinary singing voice and sets off to conquer the world of opera. Cather evidently did a lot of research for this one into the world of music, vocal performance, opera, etc. I really enjoyed the character development and Cather’s gift of making the settings come to life. I read this towards the end of college, and I remember being really struck and impressed by it and wanting Tom to read it as well. So Tom and I picked it up as our next read aloud during the winter and early spring. As you might guess from the title, it’s about an adulterous affair that has recently ended. The narrator is the man who carries on the affair, and the book moves back and forth between his memories/retelling of the entire affair; his present day depression since his lover, Sarah, has died; and Sarah’s journals that he is reading. Let me just say that I had forgotten the intensity of this story! It explores deep and heavy issues, but it’s ultimately the story of Sarah’s response to a Greater Love than what she thinks she has with Maurice. That said, it was a much more difficult read as a married person and Greene does have some rather explicit descriptions of the affair. So it’s gritty at times, but Greene also does a really amazing job of diving into the emotions and thought processes of people who are hurting, searching, and ultimately seeking fulfillment in God. I still highly recommend it, though it isn’t exactly light and uplifting! (Also, quick caveat: NEVER EVER watch the movie with Julianne Moore and Ralph Fiennes. It is complete trash and misses the entire point of the book. Ugh). Ah, Waugh. Such a funny, witty, smart, and engaging writer. This is a short little novel, following St. Helen’s life and journey to find the Cross of Christ. He really does such a fun job showcasing the absurdity of so many key players and events in the Roman Empire at the time with lots of tongue-in-cheek dialogue, in a really British way. Also, he wrote that this book was his own favorite of all his works, so if you love Brideshead, you need to read this one. This one I actually read in like, 9th grade, and promptly forgot it in its entirety. Upon re-reading it for summer book club, I’m not at all surprised. I mean, it’s Hardy. So yeah. It still was a bit ponderous to get through, even now. It was pretty good, though, once I got through all the sheep-herding explanations and demonstrations. I’m not a huge Hardy fan, but this is definitely better than his others. And then we watched the recent film adaptation with Carey Mulligan, and it was really well done: super faithful to the book, beautifully shot, and superbly acted. Bottom line: just watch it. You’ll get the story and skip all his Victorian rambling. I’m no great Forster fan either but this was for summer book club. It was ok, but Forster is clearly trying to push his ideology of progress and Romanticism: good! and tradition and moral values: bad! So that was annoying. But his characters were really funny and well done, and the lush Florentine backdrop is a pleasure to take in. Whew, well, that’s that for the late winter/spring/summer! I’ve got some good stuff waiting in the wings, but would love any additional recommendations you can throw my way! 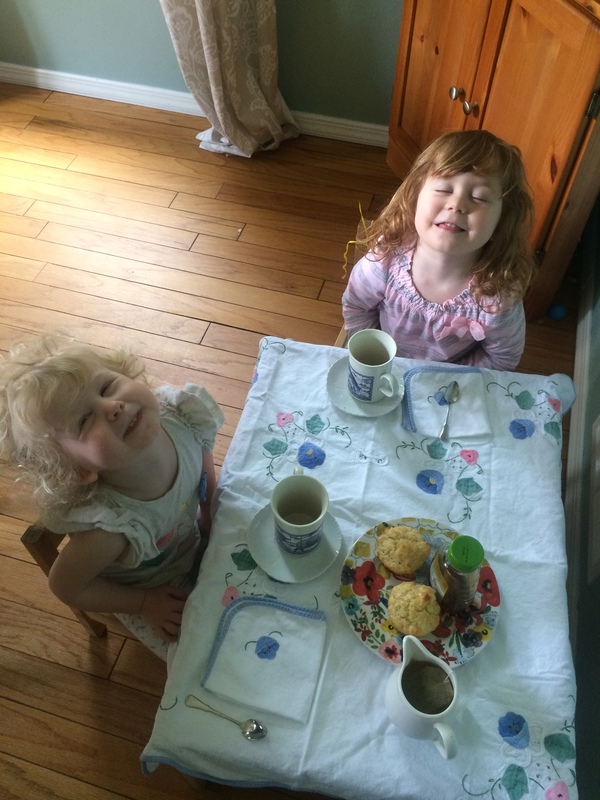 Linking up with Queen Kelly for Seven Quick Takes! 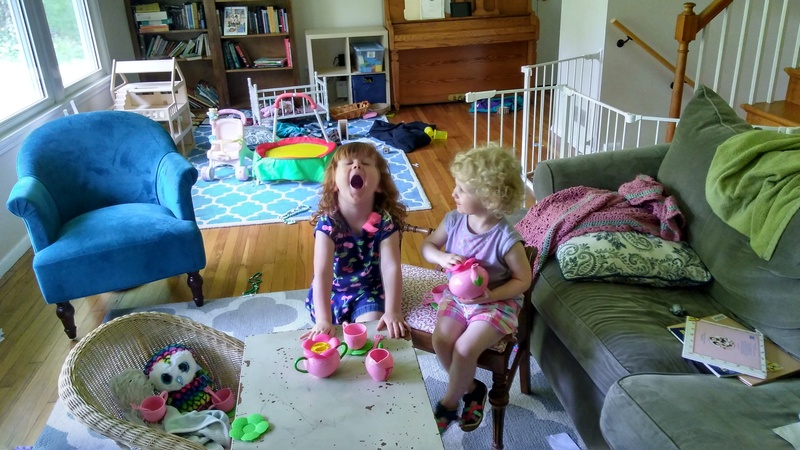 If there is one insight I gained from this past summer of intensely long days and solo parenting, it is that I can easily and constantly lose myself in the distraction of two extreme opposites: a flurry of busy work or mindless consumption of social media. They’re polar opposites at first glance, one producing the desirable (and always necessary) results of crumb-free floors, clean counters, food, folded laundry, etc, and the other of…well, nothing, really, save for seeing what other people are doing or what may be going on outside our four walls. Dear Lucy, thanks for the stealth photography of all this in action. Yet both of these activities offer something in common— a sense of escape, distraction, and the chance to turn, if only momentarily, from the stresses of the day, the clamor of three needy offspring, and the general malaise that comes from a chaotic or disordered environment. And both, usually, shut out the little people from my brain-space. Again, momentarily, but the more I try to distract myself from the craziness at hand, the more annoyed I get when my children (loudly) call me back to reality or interrupt whatever chore I’m working on. Technology (especially ye olde i-devices) makes this especially tricky. I may want to “just quickly” look up my recipe/track my package/find out the outside weather, and then find myself sucked into a 15-minute hole of Instagram scrolling, blog-reading, or clicking through a rabbit trail of something or other. The lost time then only causes more anxiety as I rush back to whatever task I was trying to get done, only to have someone need something urgently! and immediately! … and then the needs, or even the little people themselves, seem to be in the way of whatever else I wanted or needed to do (rather than the other way around). Over Labor Day weekend, I had the chance to drive out into the beautiful Shenandoah Valley for the Catholic Women’s Blogging Network Mid-Atlantic Conference. We were given a gorgeous early-Fall day, and Maeve slept perfectly on the long drive there and back. It was great to meet with like-minded women for fellowship, sharing ideas, and hearing some amazing talks about various aspects of writing and blogging. Not surprisingly, I was deeply impressed by Elizabeth Foss’s keynote talk, a woman I’ve been following in print in our local Catholic paper since I was little, and then on her blog in more recent years. Her main point was that, in order to write or blog well, we need to step back and start actually living our own real lives. She gently suggested pulling back from so much social media consumption, both to protect ourselves from comparison and envy, as well as to protect our children from a mother who’s living virtually in a scrolling feed— Instagramming all the moments she wants to display and then losing sight of the actual moment, happening right there. As I’ve thought over all of this, and talked about with Tom, I realize that part of what makes this so hard, aside from ubiquitous technology, is that my day (and the days of countless other stay-at-home moms of only tiny kids and babies) has almost no real breaks in it, during which I could leisurely check- in to social media, write, check email, and otherwise connect with the outside world. To shower, I almost always have to have the baby napping and the girls watching a show. To eat a full meal, all the children have to be fully occupied with some activity or game or whatever. Laundry, cleaning, cooking, etc, also have to take place when everyone’s involved in something, or the baby’s sleeping and both girls are interested in doing those things with me. 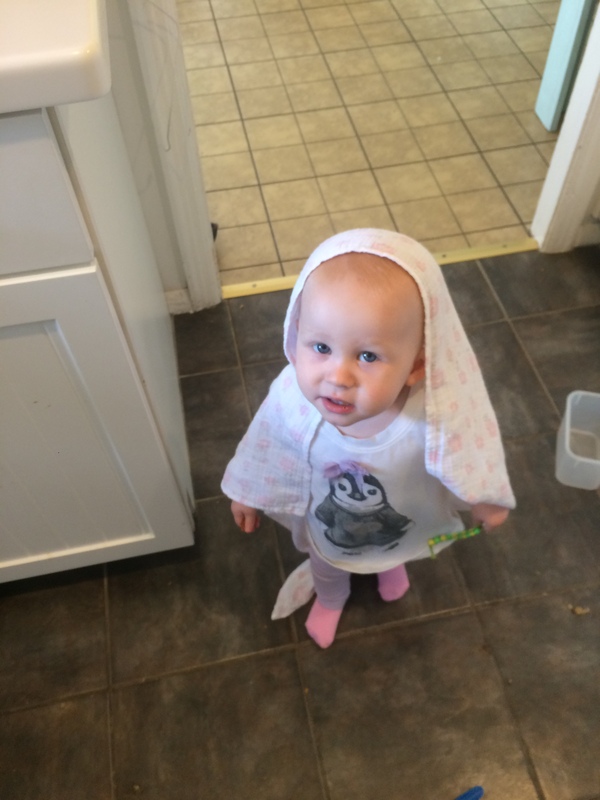 And the main kicker is that suddenly, I have a toddler /preschooler (depending on the moment!) who no longer naps, 95% of the time. So, my precious little slice of alone time, to do ALL THE THINGS, or even nap, is gone. Gone, gone, gone (sob). So I can see how it was easy and almost natural for me to fall into compulsively escaping into the world on my phone, or into a flurry of housework—it’s not like there is any other time to do those things, so I may as well do it while all my kids are awake, I guess was my unconscious reasoning. I’m glad Elizabeth’s talk brought all this into my conscious thought, and I’m all ears for how other moms make or find time to do any of the things they need and want to do. And if you have the chance to attend a CWBN Conference in your area, I highly recommend it! Thanks to Rosie for hosting on her beautiful homestead, Mary, Elizabeth, Jenny, and Ginny for their inspiring words, and the hilarious Kelly for emceeing. All the adorable and well-behaved babies of the conference! Lisa and I laughed at the fact that we each showed up with a totally different baby this year. 😉 Thanks to the talented Rachel Cupps for taking our head shots and these group photos.